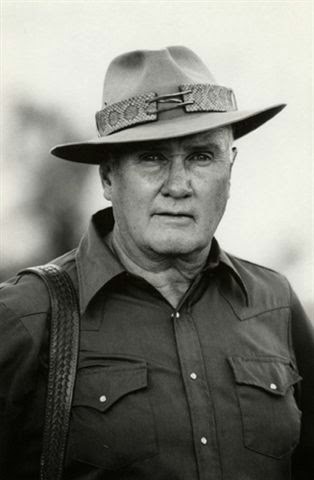 Col Jeff Cooper passed away 8 yrs ago on this date. This entry will serve a dual purpose: an "In Memory Of" as well as "The Wisdom of..."
John Dean "Jeff" Cooper was recognized as the father of what is commonly known as the Modern Technique of handgun shooting, and one of the 20th century's foremost international experts on the use and history of small arms. Cooper was commissioned into the United States Marine Corps prior to the attack on Pearl Harbor. During World War II he served in the Pacific on the USS Pennsylvania (BB-38), and then was recalled to active duty for the Korean War, resigning his commission as Lieutenant Colonel in 1956. He received a bachelor's degree in political science from Stanford University and, in the mid-1960s, a master's degree in history from the University of California, Riverside. In 1976, Cooper founded the American Pistol Institute (API) in Paulden, Arizona (later the Gunsite Training Center). Cooper began teaching shotgun and rifle classes to law enforcement and military personnel as well as civilians and did on-site training for individuals and groups from around the world. Since 1947 he published 20 books, over 500 magazine articles and columns, about a dozen videos, and numerous forwards to other author's books. Cooper died at his home on the afternoon of Monday, September 25, 2006 at the age of 86. Enjoy these quotes/writings by Col. Jeff Cooper! This preoccupation with equality is another symptom of the degeneracy of The Age of the Common Man. In the first place it is an illusion, since men are not created equal, except in the political sense. Everyone is better or worse than someone else in a particular example of his capacities, and pretending that this is not so is simply silly. Excellence, not mediocrity, should be everyone’s goal, and it is hard to think of anything, from gardening to crossword puzzles, at which someone may not excel. Heroism is never futile, for it is a thing of the soul, demonstrating that man is more than just another animal. This is a truth that needs emphasis in the dingy modern era, when the race’s most basic values are under attack. Honor is, at last, all we can take with us. You must remember that with the rifle it is not how far away the shot was, but how close you were able to get. I have been shooting seriously since my late teens, and I have taken just six long shots that I remember. (By long shots I mean shots 300 meters or over.) I do not mean to set myself up as an example, but I need to point out that if one is forced to take a long shot, he owes himself an explanation. "There was no way I could get any closer." As time passes we discover that there are a good many readers who have not been to school and who are puzzled by our reference to "The Mozambique Drill." I added The Mozambique Drill to the modern doctrine after hearing of an experience of a student of mine up in Mozambique when that country was abandoned. My friend was involved in the fighting that took place around the airport of Laurenco Marquez. At one point, Mike turned a corner was confronted by a terrorist carrying an AK47. The man was advancing toward him at a walk at a range of perhaps 10 paces. Mike, who was a good shot, came up with his P35 and planted two satisfactory hits, one on each side of the wishbone. He expected his adversary to drop, but nothing happened, and the man continued to close the range. At this point, our boy quite sensibly opted to go for the head and tried to do so, but he was a little bit upset by this time and mashed slightly on the trigger, catching the terrorist precisely between the collar bones and severing his spinal cord. This stopped the fight. Upon analysis, it seemed to me that the pistolero should be accustomed to the idea of placing two shots amidships as fast as he can and then being prepared to change his point of aim if this achieves no results. Two shots amidships can be placed very quickly and very reliably and they will nearly always stop the fight providing a major-caliber pistol is used and the subject is not wearing body armor. However, simply chanting "two in the body, one in the head" oversimplifies matters, since it takes considerably longer to be absolutely sure of a head shot than it does to be quite sure of two shots in the thorax. The problem for the shooter is to change his pace, going just as fast as he can with his first pair, then, pausing to observe results or lack thereof, he must slow down and shoot precisely. This is not easy to do. The beginner tends to fire all three shots at the same speed, which is either too slow for the body shots or too fast for the head shot. This change of pace calls for concentration and coordination which can only be developed through practice. Mike Rouseau was later killed in action in the Rhodesian War. May he rest in peace! The everlasting problem for the shooter remains gunhandling. Of the three elements of shooting skill - marksmanship, gunhandling, and mind-set - it is gunhandling which gives us the most trouble. The way people handled their weapons at the SHOT Show was enough to make one's blood run cold, and many of these people are presumably "experts" in the firearms field. It would seem that while a great many shooters understand the four basic rules of safe gunhandling, they seem to think that the rules only apply on the range when under supervision. I have tried for decades to impress upon people the fact that the four rules are immutable and ever present. They apply at all times and in all circumstances. Somebody asked me what they were the other day (somewhat to my dismay), so for the purposes of those who came in late let me put them forth again now. The only exception to this occurs when one has a weapon in his hands and he has personally unloaded it for checking. As soon as he puts it down, Rule 1 applies again. You may not wish to destroy it, but you must be clear in your mind that you are quite ready to if you let that muzzle cover the target. To allow a firearm to point at another human being is a deadly threat, and should always be treated as such. This we call the Golden Rule because its violation is responsible for about 80 percent of the firearms disasters we read about. Having invented my own personal color code for individual response to personal danger, I like to feel that I ought to know just what it implies. This is, of course, not obligatory. I may have designed the code, but nobody is obliged to observe it as I declared it. Still I wish people who wish to use it would use it as designed, rather than as improvised after the fact. Specifically, I would like to insist that my own four-stage color code refers to decisions to take deadly action, rather than a degree of danger. As I have designed it, the color code designates that psychological condition which enables you to take action which is very unusual in your experience and which may result in lethal violence. A reasonably well-adjusted human being finds it very difficult to take lethal action against another human being. It is so difficult that it may prevent him from saving his own life. I have described it, taught it and written it up several times, and I am satisfied that it works as I have created it. It has on several occasions saved the life of the individual who had used it correctly. Put as simply as possible, the color code runs White, Yellow, Orange, and Red. It does not need amplification, but it does cover the subject in hand completely. That is putting it as quickly as possible, and we can go into it further at your convenience. The will to survive is not as important as the will to prevail ... the answer to criminal aggression is retaliation.